Resolver provides a software solution for risk management, internal audit and control, compliance and risk assessment. It also offers solutions for incident management, investigation, case management, and security operations. Resolver helps organizations address internal audit and risk assessment requirements as well as physical security needs. 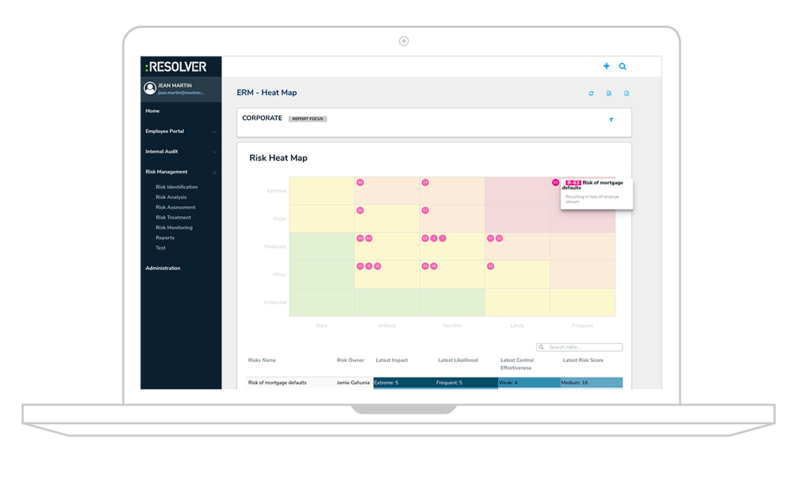 Resolver addresses multiple security areas, including Enterprise Risk Management, which helps identify key risks to organizational objectives, assists in managing the risk, and ensures that the risk exposure is within acceptable margins. It also ensures that action is focused on the risks that matter. Internal control provides visibility into testing progress, potential issues, and remediation status. Resolver ballot is a platform for risk assessment that keeps organizations in the know with regard to assurance and remediation spending. Compliance management ensures efficient compliance in a complex and fluid regulatory environment. Internal audit assesses risks, informs assurance strategy, plans and executes audits, and ensures management actions are carried out. The incident management provides a total solution for responding to, reporting on, and investigating incidents, so organizations can manage resources, minimize impact, and prevent incidents. Incident reporting documents the who, what, when, and where along with the ability to add documents, photos, videos, associated losses, responses, outcomes, involvement, and corrective actions. A built-in activity log is included, and occasional or remote users can log incidents through a web portal. Also included are the ability for computer aided dispatching that integrates with multiple solutions, investigation and case management that allows investigators to securely consolidate related incident and investigation data into case records for comprehensive tracking, analysis, and reporting, and an array of dashboards, analytics, and trend reporting to provide answers to help organizations strengthen their protection and reduce risk exposure. Still not sure Resolver is right for you? Use our Product Selection Tool to compare other ERM solutions. Have questions? Call one of our unbiased Technology Advisors for a free consultation. Learn everything you need to know about Resolver. Our experts will reach out to you shortly.